Erin Lee P.A., received her undergraduate degree in Biology at North Carolina State University. She furthered her education by obtaining her Master’s degree in Surgical Physician Assistant Studies at the University of Alabama at Birmingham. 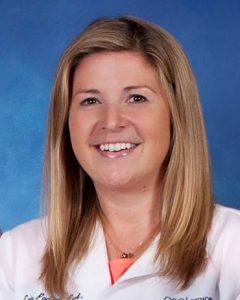 After graduation, she began working as a Physician Assistant at OSC for Dr. Mark McFarland, assisting him both in the operating room and the office. Their practice is focused primarily on spine-related disorders, minimally- invasive joint replacement and all general orthopedic pathology. Erin is board certified by the National Commission of Physician Assistants and licensed to practice by the Commonwealth of Virginia. She is a current member of the American Academy of Physician Assistants and Virginia Academy of Physician Assistants. Outside of work, Erin enjoys running, watching football and spending time with her family. To make an appointment with Mark W. McFarland, D.O. or Erin Lee, P.A., contact our office today. To learn more about spine services, visit our Spine Care page.